Walt Disney World plans to demolish about one-fourth of its troubled Disney Institute resort and build 192 new time-share units there. The Disney Institute opened more than five years ago but has been largely shuttered of late because attendance has declined. But Disney’s “Vacation Club” time-share apartments are hot sellers. Customers, mostly with families, plunk down between $11,000 and $150,000 for the right to stay at various Disney resorts, including the time-share units themselves, for periods ranging from one week to more than a month annually. Construction on the new time-share apartments that will displace part of Disney Institute will start in the spring, said George Aguel, senior vice president of Walt Disney Parks and Resorts. The new resort, scheduled to open in 2004, doesn’t yet have a name. “We’re still working on a theme,” Aguel said. Located near the Downtown Disney and Pleasure Island entertainment-dining areas, the new time shares are evidence that the strategy of selling resort units is more viable than opening more hotel rooms. Last year, Disney World indefinitely delayed the planned opening of its huge Pop Century hotel and closed its Port Orleans resort. In sharp contrast, the 536 Vacation Club rooms that opened in 1996 in Disney World’s Boardwalk Villas are nearly sold out, Aguel said. 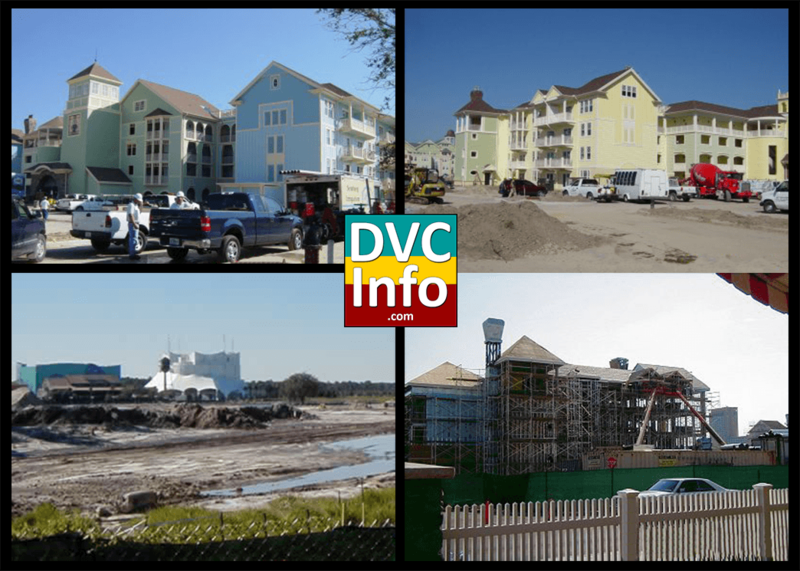 Another Disney World time share, Beach Club Villas, is scheduled to open this summer, he said. Pre-opening sales are to begin in February. Disney Institute rooms were priced from $200 to $500 a night. Disney officials have previously said that the cutbacks at Disney Institute are partly a result of the post-Sept. 11 travel slowdown. Disney World has almost 22,000 hotel rooms and about 2,000 time-share units. 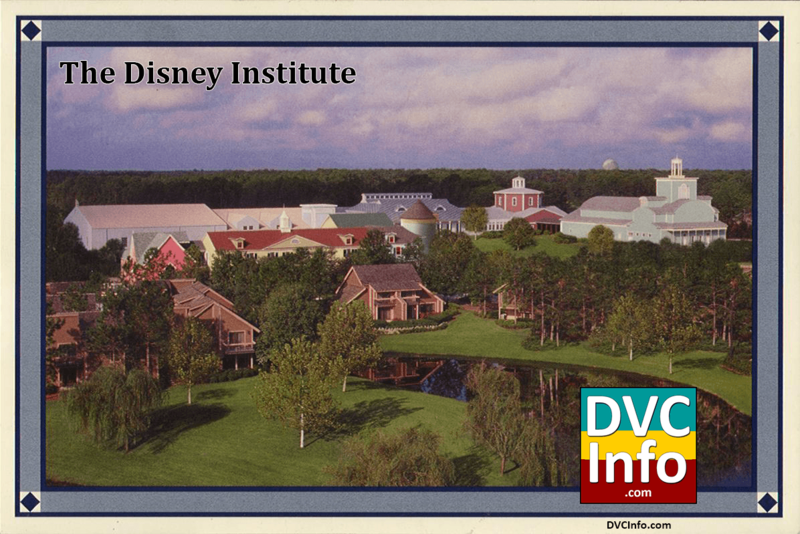 Ensconced in a leafy area bordering a golf course, Disney Institute derived its name from the educational entertainment concept on which it was founded. The brainchild of Walt Disney Co. Chairman Michael Eisner, it began as a resort that combined vacations with the study of personal-enrichment pursuits such as gardening and the arts. But the hotel, which housed such famous guests as President Clinton, failed to achieve the kind of success Disney management expected. Founded in a year of record crowds at Walt Disney World, Disney Institute now often has a deserted look. After initially catering to tourists seeking a different Disney experience, the focus later shifted to business travelers and corporate groups. The Saratoga Springs Resort Spa — Set To Open In 2004. — Will Replace The Disney Institute, The Now-defunct Educational Resort. About 480 Time-share Units Are Planned For The Site. 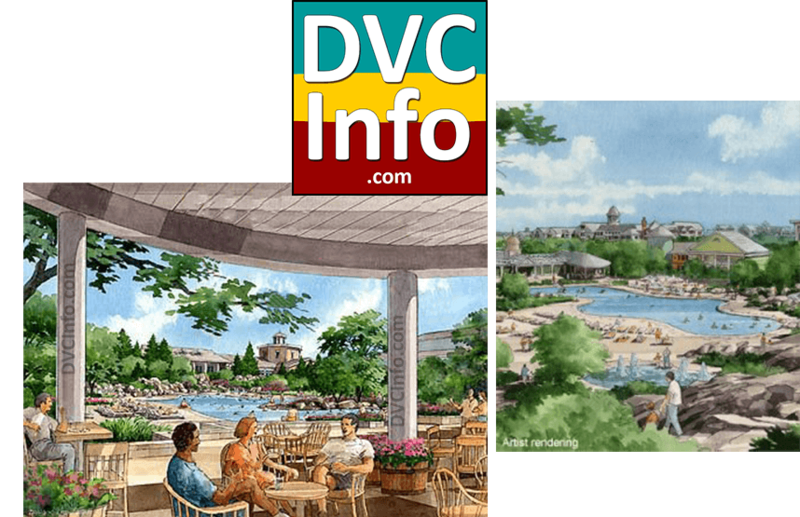 The defunct Disney Institute is being reinvented as a turn-of-the-century time-share complex called the Saratoga Springs Resort Spa that will open in 2004. Saratoga Springs, already under construction, is being modeled after its namesake, the getaway town in the early 1900s for the affluent in eastern New York best known for its mineral springs. For example, the pool area at the resort will be designed without the usual Disneyesque water slides — focusing instead on a natural spring look with bubbles foaming up among rocks. The resort will include 184 new units and about 300 remodeled apartment-style rooms in older buildings that were part of the Disney Institute. The campus-style buildings that contain the older rooms may also be enhanced to reflect the upstate New York theme, said Mariska Elia, a spokeswoman for Disney’s time-share operation, called Vacation Club. Saratoga Springs will be the latest addition to Disney’s Vacation Club time-share apartments, which are hot sellers. Disney World already has about 2,000 time-share units along with its 22,000 hotel rooms. Elia said the older section of the complex, the former Disney Institute, may also be converted to time shares. Prices to purchase one week in the new section of Saratoga will range from $12,000 to $150,000 for rooms and suites that sleep up to 12 guests each. Aside from the pool, the 16-acre facility will have a playground and barbecue pavilion. Ensconced in a leafy area bordering a golf course, Disney Institute opened more than five years ago but was largely closed during the travel slump that began after Sept. 11, 2001. The institute derived its name from the educational entertainment concept on which it was founded. The brainchild of Walt Disney Co. Chairman Michael Eisner, it began as a resort that combined vacations with the study of personal-enrichment pursuits such as cooking, gardening and the arts. But the hotel, which housed such famous guests as President Clinton, failed to achieve the kind of success Disney management expected. Founded during a year of record crowds at Walt Disney World, the Institute had faded by last year into a largely deserted area. After initially catering to tourists seeking a different Disney experience, the focus later shifted to business travelers and corporate groups. Although a few rooms at the former institute remain open, most of its 800 employees have been transferred to other jobs in various parts of Disney World’s hotels and theme parks. Walt Disney World still offers a variety of business seminars for groups at various Disney World resorts through a mobile Disney Institute program, which has 45 employees. “Having a facility was nice, but there were constraints to that,” said Larry Lynch, director of the institute business. One drawback of the old site was that potential clients — often large companies — viewed the campus as too small. He said the institute held its largest gathering — 1,200 people — for a seminar on leadership and customer service last month at the Grand Floridian resort. “That’s bigger than anything we had in our own buildings,” Lynch said. Located near the Downtown Disney and Pleasure Island entertainment-dining areas, the new time shares are evidence that the strategy of selling resort units is more viable than opening more hotel rooms. Was the opening of the Disney Vacation Club the first appearance of villas-style accommodations at Walt Disney World? For those of you who were unaware, there were vacation villas for years on the land where Saratoga Springs Resort now sits. 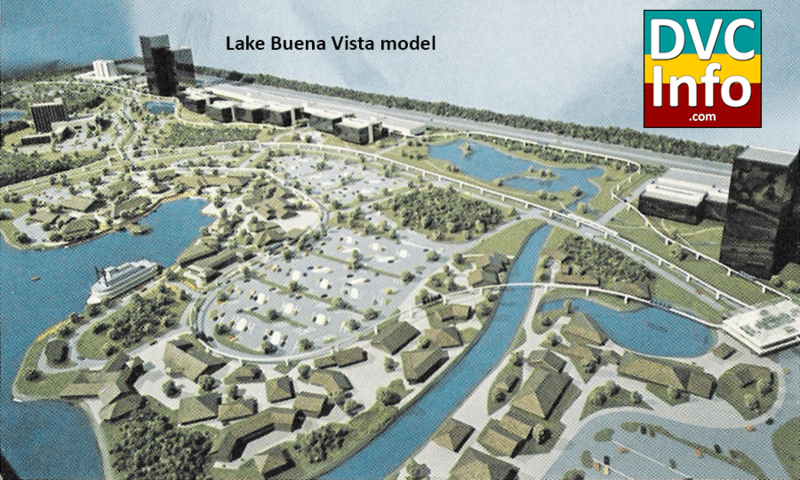 Disney had planned on building a residential community called “Lake Buena Vista” which would have homes, recreation and shopping. Lake Buena Vista would encompass four themed communities, a Golf, Tennis, Boating and Western community. Each of the four communities would have their own town homes. 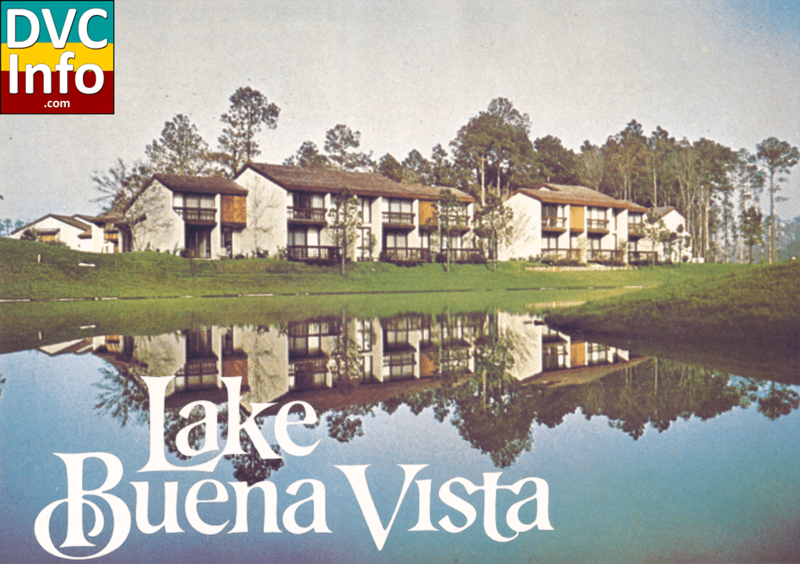 In June of 1973, plans were announced for a residential community to be called Lake Buena Vista. However, Disney realized that if a municipality were incorporated, it would require the residents who lived in Lake Buena Vista to have voting rights. This would create a problem as they would be able to vote on any further construction on resort property and taxation issues would arise. So, while Disney moved forward, the facilities would be used by vacationers and not for permanent residents. 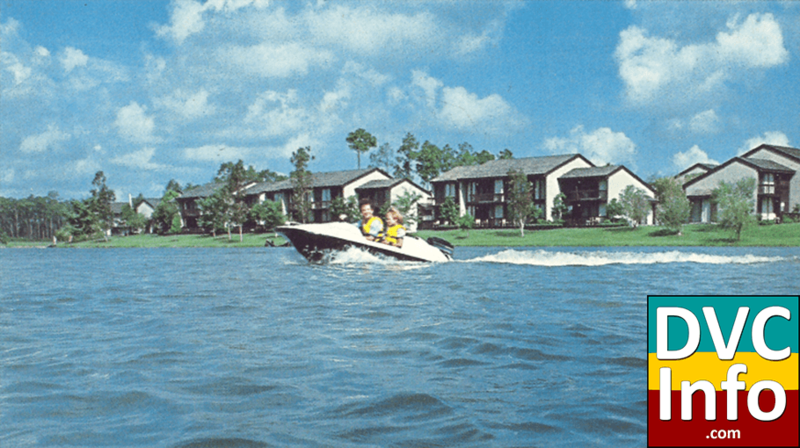 By May of 1974, a total of 133 town homes had been constructed and a shopping center called the Lake Buena Vista Village was being built. In October of 1975, 60 Treehouse Villas were completed. 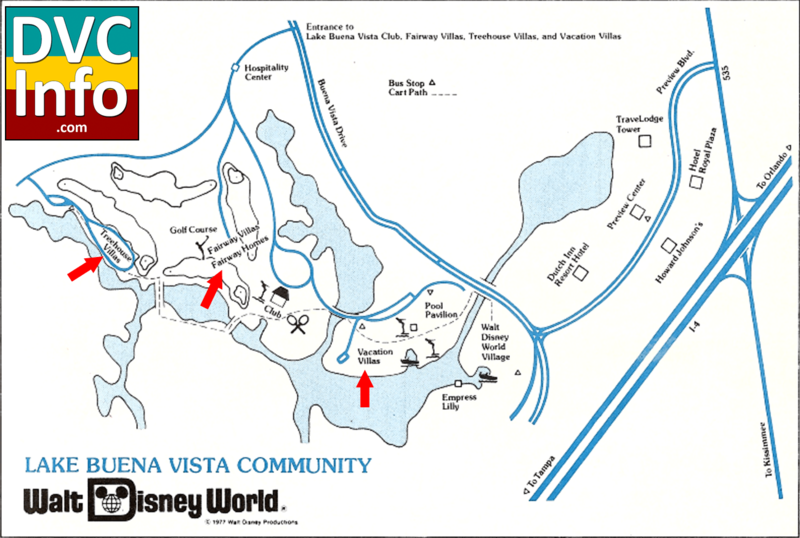 At the same time the Lake Buena Vista town homes were being built, the Lake Buena Vista Golf Course was being built simultaneously. From 1976 through 1978, Disney added more villas. The villas were renamed as the Walt Disney World Village Resort in 1985. In 1989, to coincide with the opening of Pleasure Island and the renaming of the Walt Disney World Village to the Disney Village Marketplace, the Villas’ name was again shortened to Disney’s Village Resort. In 1995, construction started on Michael Eisner’s vision for a learning center called the Disney Institute, which opened on February 9, 1996. Guests chose from a wide selection of interactive programs in the areas of Entertainment Arts, Performing Arts, Story Arts, Design Arts, Culinary Arts, Lifestyles, Gardening & the Great Outdoors, and Sports and Fitness. The facilities included Seasons Dining Room, a store (Dabblers), studios for animation, design arts, culinary arts, radio and TV, a 400-seat cinema, a 225-seat amphitheater, and a large 38,000-square-foot sports and fitness center and spa. 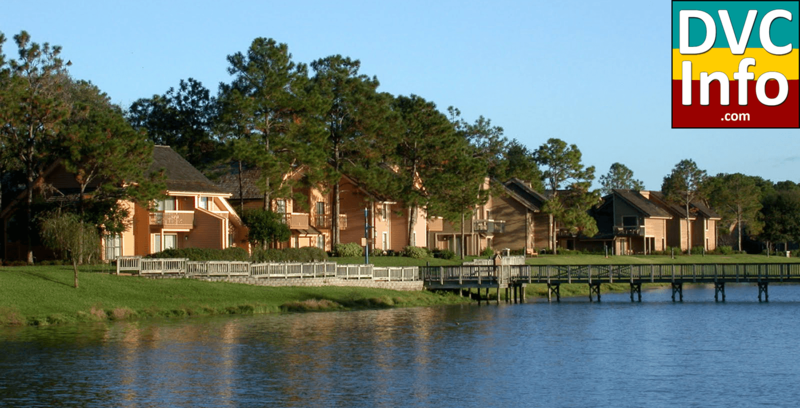 The former Village Resort accommodations became part of the Disney Institute—Bungalows (formerly Club Suites), Townhouses (formerly Vacation Villas), Treehouse Villas, Fairway Villas, and Grand Vista Homes. In the summer of 2000 the Institute no longer offered programs to individual tourists, but rather focused on programs that catered to groups and corporate retreats, a shift that had begun in late 1996. The last guests stayed at the Disney Institute on February 11, 2002. 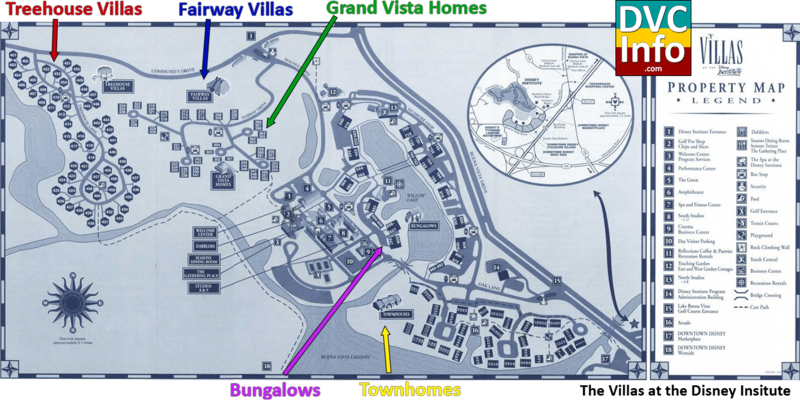 So the villas were renamed to The Villas at the Disney Institute in 1996. 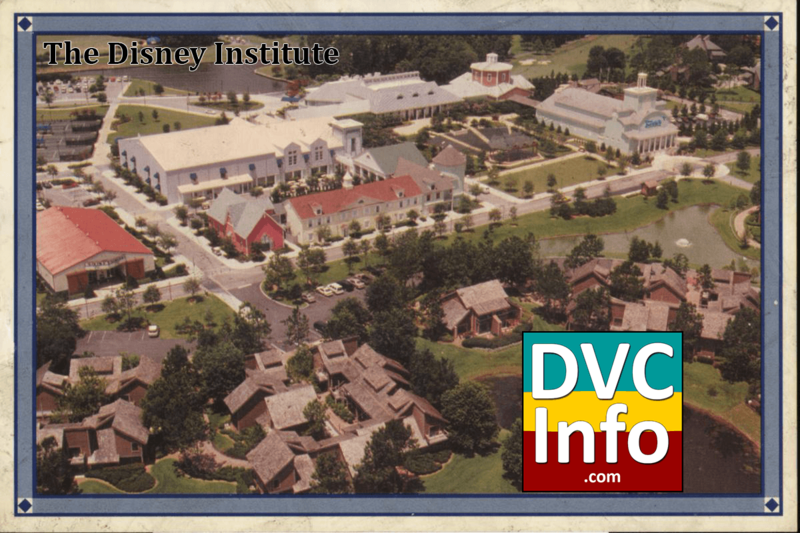 This old map of the Disney Institute should look familiar to those that have stayed at Disney’s Saratoga Springs Resort. Here is a postcard from The Villas at the Disney Institute. Do you notice any structures that look similar to those at SSR? Here’s a shot of SSR today. After the tourist slump that followed September 2001, the Disney Institute, along with the villas, finally closed its doors in 2002. 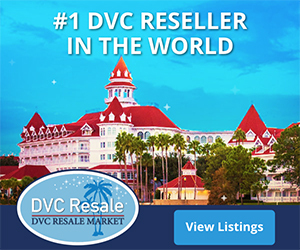 Given the success of Disney’s Vacation Club, the most cost effective measure for the closed resort was to convert the entire property into a Vacation Club property. Disney abandoned its plans for the Eagle Pines DVC and instead focused on re-using the Lake Buena Vista property. 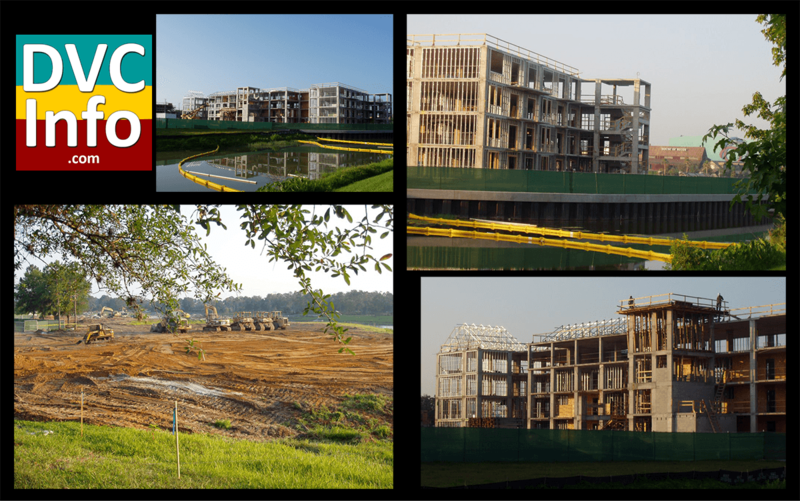 Work began on what would become Disney’s Saratoga Springs Resort. The newest buildings constructed in 1995 were kept and all the original 1970’s buildings were demolished, with the exception of the Treehouse Villas. The 1995 Institute structures received a minor horse-themed overlay: the lobby became known as the “Carriage House”, the Seasons dining room re-opened as the “Turf Club” with whimsical jockey jackets on the walls, and so on. 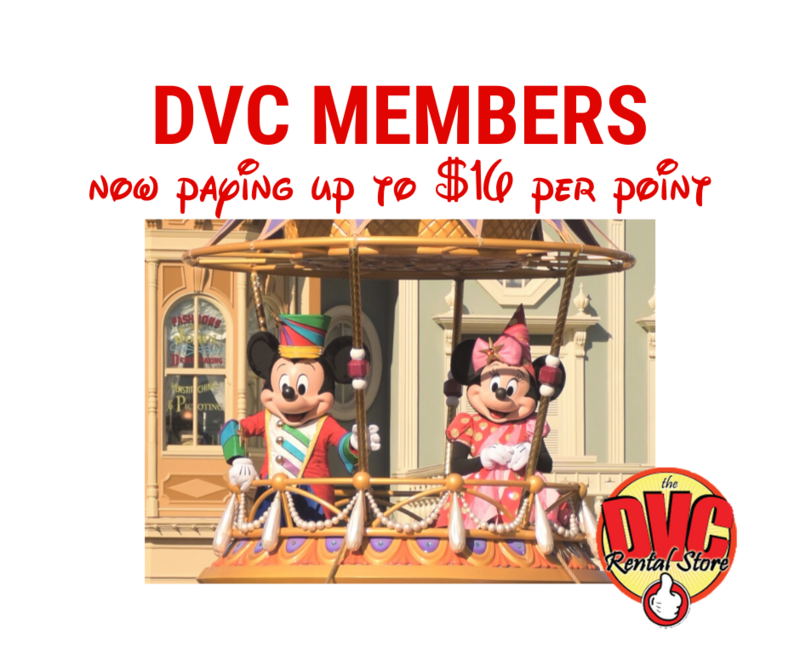 Disney just added on multiple 4-story DVC units. When the Disney Institute closed, Disney kept the Treehouse Villas as housing for International College Program Cast Members. However, in 2004, Hurricane Charley, hit Central Florida and impacted several of the original Treehouse Villas. The entire complex was abandoned because of new Americans with Disability Act laws and South Florida Water Management restrictions, that would have caused the Treehouses to have been completely rebuilt. They remained in a state of disrepair until 2008 when they were leveled and replaced with new Treehouse Villas opening in the summer of 2009 as part of Disney’s Saratoga Springs Resort.